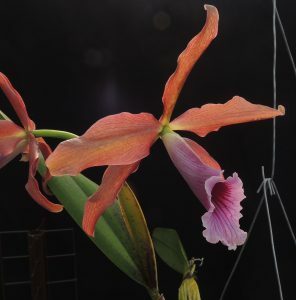 This Cattleya species from Brazil and has a lot in common with its close relative Cattleya purpurata. It grows as an epiphyte in open lowland forest up to around 1000m and so enjoys warm conditions and good light. We hand our plant in the roof of the Warm Americas Zone. Its name tenebrosa means ‘dark’ referring to the flowers but it does come in a range of colours from yellow to a deep brown with a contrasting pink and purple lip. we are delighted to have many thousands of these growing in-vitro so look out for them on out sales table.